MC Conditioner - All Things Hip Hop! : 2Pac - A Tainted Legacy? 15 years ago to the day (well yesterday, but let's not quibble), Tupac Shakur was the vicitm of a drive by shooting in Las Vegas. I almost chose not to write about the anniversary due to the abundance of tributes already made, and it seemed difficult to say anything new. After some thought I decided to discuss the posthumous work left by the legendary MC, rather than concentrate on his heavily documented eventful life. Left paranoid by the infamous Quad Recording Studio shooting, Pac recorded 100's of songs in a few productive months on Death Row Records, motivated by the belief that he would soon be dead. This, of course, turned out to be grimly prophetic, as less than a year later he was gunned down. This meant that in addition to the 6 albums completed while he was alive (Don Killuminati was released posthumously, but was completed before the shooting), the label still had material for numerous releases. At the current standings, 8 full length albums have been released since his death, including one greatest hits. That leaves 7 releases, the majority of the rhymes being written in the aforementioned recording frenzy. There are two problems with this. The first is that the tracks were recorded at a specific moment in time. A highly creative and fruitful few months undoubtedly, but the material suffers from a lack of variety. Artists naturally evolve over time, so the recordings become samey, stagnant and unoriginal as depths are plumbed. With The Notorious B.I.G we are faced with precisely the opposite problem: The rapper died after completing only 2 studio albums, with just enough leftover material to scrape together a third. The second issue is the lack of quality control. It is natural that in recording over 100 songs there are going to be a certain number of poor quality raps that do not quite live up to the high standard expected. Again, this is a natural process of creating art: not everything a great author writes is fantastic prose and not everything a great songwriter puts down on the paper is genius. That is not to say that everything released after the death of 2Pac is terrible, 'Ghetto Gospel', 'Thugz Mansion' and 'Changes' are notable additions to the canon, but for every excellent track there is always going to be a 'Pac's Life'. On the subject of 'Pac's Life', there has also been a trend of pairing substandard acts with the rapper (I'm looking at YOU Chamillionaire and Lil Scrappy), which surely only serve to dilute the impact and legacy of the hip hop legend. 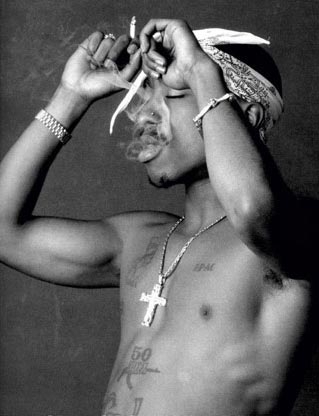 'Pac taught me to be a leader and that rappin' wasn't just music, it was poetry from the heart'. 'Keep Ya Head Up' - Strictly 4 My N.I.G.G.A.Z.